The end of the year is coming fast, and November has been crazy! 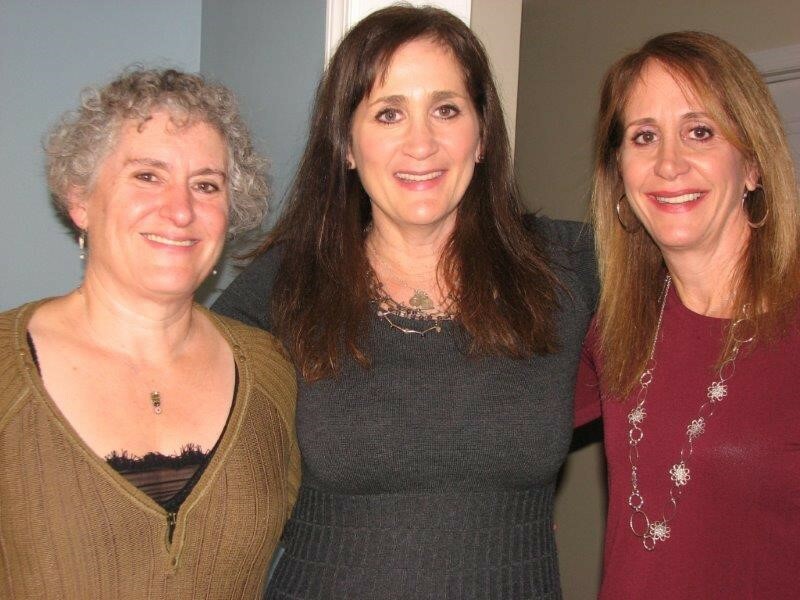 I had a quick visit to Philadelphia to meet up with my sisters for a happy family event. We packed in the activities, as we always do. Our mother was not one to sit still, and she trained us to be the same way. I really like cake, plain simple unfrosted cakes. I could take or leave birthday cakes or other layered cakes, but I always enjoy a pound cake, a Bundt cake, or any kind of one layer cake. A simple glaze or a dusting of powdered sugar makes them complete, no fussing required. For Howard, I think it’s all about the frosting as he never gets excited when I make a cake, so they are usually relegated to occasions where I’m having just my friends over or bake something to bring somewhere else. My favorite bakery cake is the Vanilla Bean Pound Cake made by Hi-Rise Bakery in Cambridge. They are regulars at the Lexington Farmers’ Market and, in season, I treat myself to a slice about once a month. The genius of their cake is that it’s soaked in vanilla-infused simple syrup, making the outside crust magical. Eating an end piece with its extra crust is just heaven. I’ve never made it myself, but here’s the recipe. 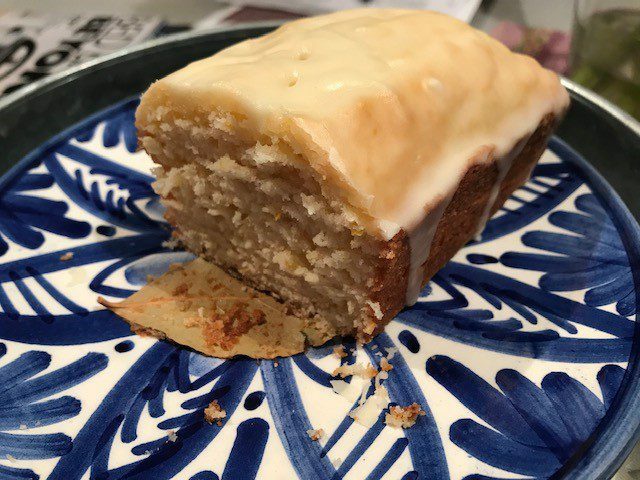 Right before I left, I made David Lebovitz’s Bay Leaf Pound Cake, the first November challenge recipe for Cook the Book Fridays. I did NOT need a whole cake. I had nowhere to bring it that week. So, I minified it. 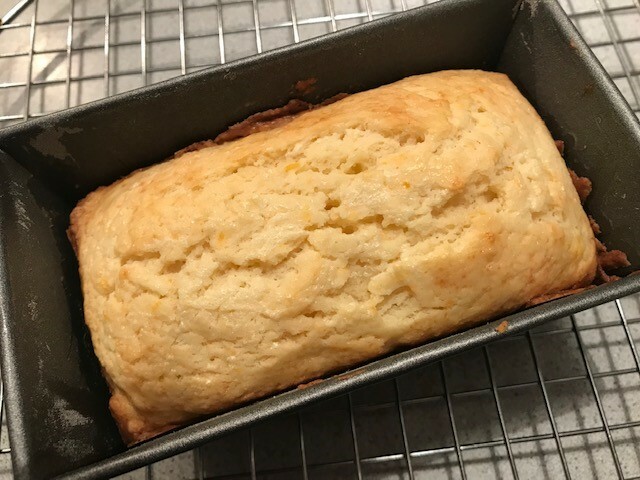 I made one-third of the recipe (dividing by the eggs, of course) to fill one small loaf pan – a personal pound cake. This cake is a little different than a traditional pound cake recipe because rather than creaming the butter, the butter is melted. 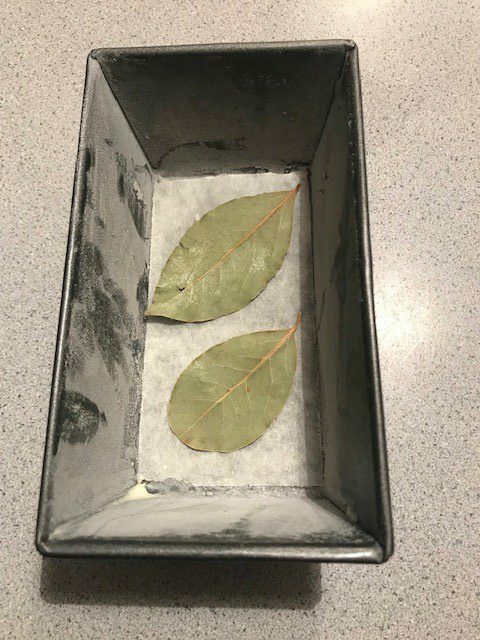 In this case, the butter is then infused with bay leaves to add some depth of flavor. A couple of bay leaves are also set on the bottom of the pan to add more bay flavoring. We are also instructed to squeeze a line of soft butter on top of the cake to enhance a decorative crack. It could be because of my smaller pan, but that didn’t happen on my cake. The final touch was an orange glaze. The cake’s predominant flavor was orange. Even with the infused butter and extra leaves, I didn’t notice the bay flavoring at all. Overall, this was a lovely cake, small enough for me to eat a daily slice for a few days. It wasn’t interesting enough to make again, though I did enjoy it while it lasted. The second recipe for Cook the Book Fridays is Panade de Butternut (Butternut Squash Bread Soup). 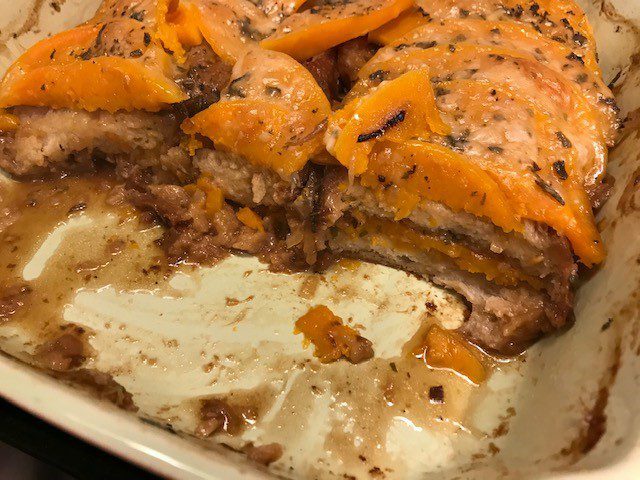 To read the C&C (comments and concerns) post for this recipe, it wasn’t getting a lot of love, so I was a bit wary. The recipe took a bit of advanced planning. David recommends homemade stock for this one. We were finishing up a whole chicken, so that was easy enough with a carcass on hand. I’ve been making stock in the slow cooker for the past few years which is so simple. Sourdough bread was also required. 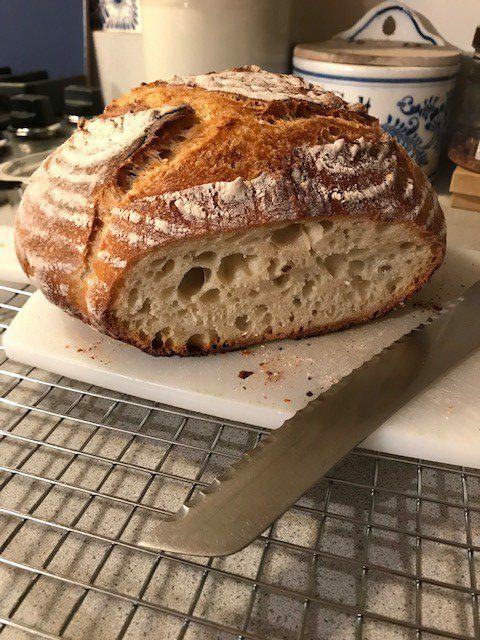 My sourdough starter needed a workout this week, so I managed to bake my own loaf to use. Stock? Check! Bread? Check! I was ready to go. 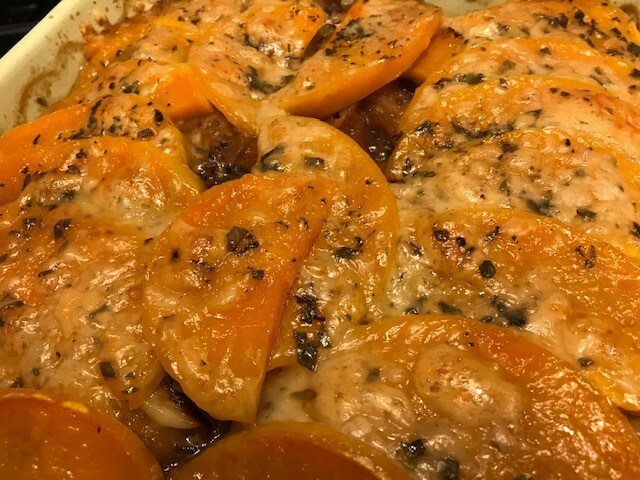 This panade is a layering of caramelized onions, toasted sourdough bread, sliced butternut squash, chopped thyme and sage, and grated cheese doused with the homemade chicken stock. I halved the recipe for our household. I must have sliced the bread too thickly because there wasn’t nearly enough to fully cover the pan for even two layers, and the recipe called for three. That means I had three layers of squash and just two of bread, which was fine. Soup? Bread Pudding? Casserole? Whatever… Delicious! As the panade baked, the bread absorbed all the stock, so the result was more like bread pudding than soup. It also reminded me of a lighter version of the filling for a stuffed pumpkin I’ve made. Whatever it was, it was delicious! All the flavors of fall combined into one hearty dish. It would be a wonderful alternative to stuffing for the Thanksgiving table. On the downside, if I’m being honest, even though I really liked it, in my opinion, it was a lot more work than it was worth. Judge for yourself! Recipes for both the pound cake (page 296) and the panade (page 163) can be found in David Lebovitz’s My Paris Kitchen. My friends from Cook the Book Fridays made these too. You can find their reviews for the cake here and the panade here. I’ve recently started cooking through Everyday Dorie with my friends from Cook the Book Fridays. I adore Dorie Greenspan’s recipes and encouraging voice. She makes me open to veering from my tried-and-true way of cooking a familiar ingredient. I’m a devotee of roasted Brussels sprouts. 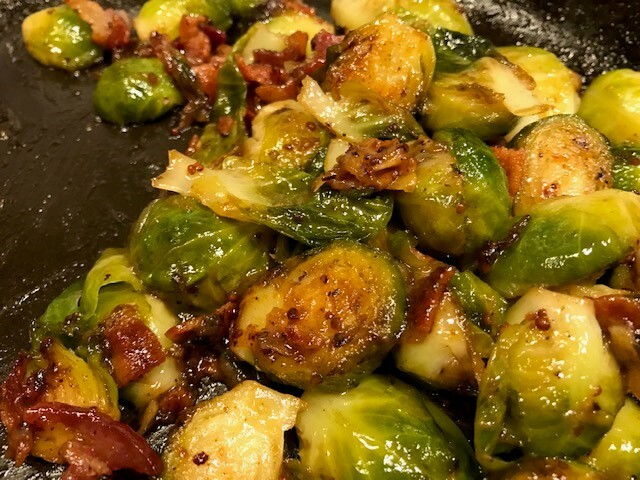 Sure, when I first starting eating Brussels sprouts, I steamed or boiled them, but once I had them roasted, I never looked back. It’s Friday, so it’s time for another recipe challenge. This week’s selection is Maple-syrup-and-mustard Brussels sprouts. The sprouts are streamed, then sautéed. Not roasted, but something new. The flavors here are layered, one after another. 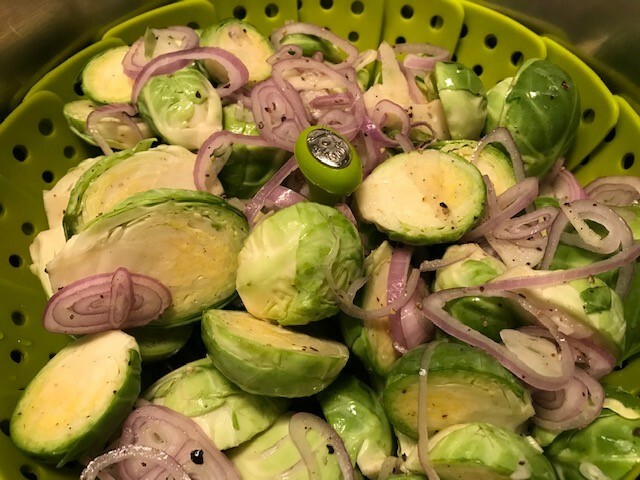 The Brussels sprouts are not simply steamed, but first tossed with sliced shallots and garlic and seasoned with salt and pepper before steaming. An interesting twist. The flavors infuse the Brussels sprouts making them instantly more complex. Next the veggies are sautéed in a blend of olive oil and bacon fat to brown them up a bit and add even more flavor. Next, the sprouts are glazed with maple syrup and Dijon mustard (I used both seeded and smooth). If that isn’t enough, crumbled bacon is stirred in. Lots of complex flavor but not a lot of work. We mostly liked this recipe. 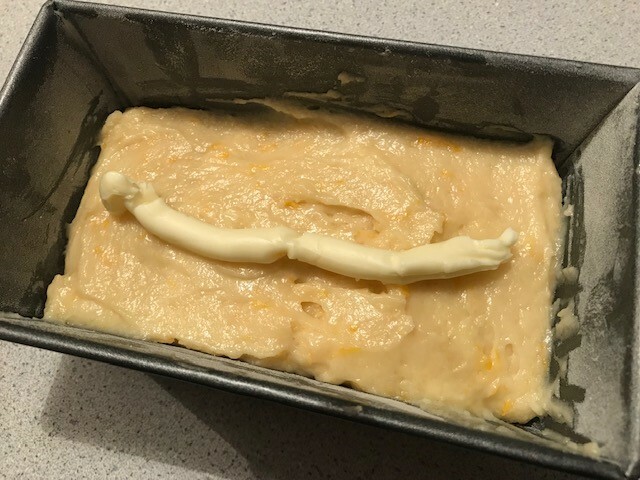 However, we both found it a little too sweet. Dorie mentions that one could add a splash of cider vinegar. I didn’t do that, but maybe that would have cut the sweetness. Dories also suggests balsamic vinegar as an alternative to the maple syrup, so I might try that next time. I served the Brussels sprouts alongside a reprise of David Lebovitz’s chicken pot pie, this time with biscuits. Verdict on the pot pie: we like the potato topping much better. Brussels sprouts are a given on my Thanksgiving table, so this version could make another appearance very soon. If you want to try it, you can find the recipe on page 212 of Everyday Dorie or on-line here. 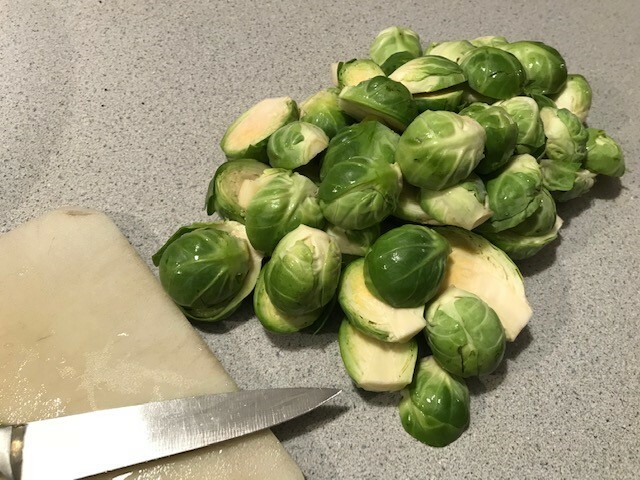 To see what my friends from Cook the Book Fridays thought of the sprouts, follow their links here.